Get the elements of a tuxedo right before a much-awaited black tie event and wear it with suave confidence. The classic fuller tuxedo that moulds itself to your body and adds volume has been all but replaced with contemporary slim-fit two-button tuxedos, which are narrower with a flattering silhouette. With the tuxedo getting shorter and slimmer, you can experiment to accentuate your shoulders or show off the results of all those hours spent slogging at the gym. 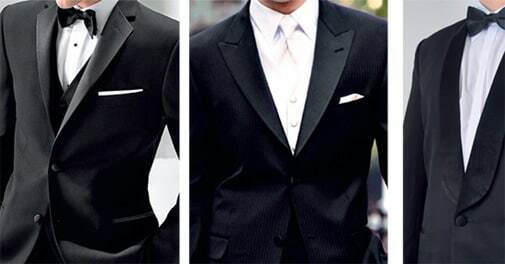 But don't fret if you haven't had time to hit the gym, the right tuxedo will invariably flatter your physique. Notch lapel The classic option for single-breasted tuxedos, this is the safest collar you can opt for. A tuxedo with slim notch lapels is a wardrobe staple. Peak lapel You need flair to carry off the traditional peak lapel, which essays the tailcoat's flamboyant elegance with ease. Peak lapels are decidedly more fashionforward, and donning one of these exclusive double-breasted pieces at a wedding or a formal dinner is sure to turn heads. Shawl lapel Characterised by a sweeping, rounded edge with no dents, this is another traditional choice that goes perfectly with modern aesthetics.